Great ways to keep the kids busy this summer! Being parents means being creative in the summer. Gone are the days where mums only have children to raise. Mums are now multitasking to no end and maximising every minute of the day to get everything done. With 6 weeks to keep the children busy, we’ve come up with some ideas to keep the kids occupied! 1. Table murals: Simply tape the butcher paper to the table, and turn the kids loose with crayons, markers, or watercolor paints. This will encourage their creativity and lets face it…have fun! 2. Farmers’ markets: local farmers’ market are bursting with fresh fruit, veggies, farm-fresh eggs, and even meat from local growers. It can be a fun outing for kiddos. Let them choose something new and different to bring home, and then prepare it together for dinner. Another option is to go straight to the farm and pick the fruits They eat all the fruits they can hold, and we take the rest home to freeze. Who can say no to a Blueberry pancake? 3. Library: Books, books, and more books! Indoor summer fun in an air-conditioned building! The library is the perfect place to get out of the heat on a hot summer day when you don’t want to be cooped up at home. 4. Make a list of your favourite childhood games: old favourites such as hopscotch, putting on a show or marbles won’t cost the earth and your children will enjoy you reminiscing! 5. Design a game: In the evenings get the kids to design a game that you can make the next day – give them ideas to keep it simple such as a paper boat race in the paddling pool or homemade skittles using a tennis ball and empty toilet rolls. 7. Encourage the kids to put on a play or a magic show: They could even use the dress up clothes and props from around the house. If you have a camera, you can even film it, for great memories. 8. 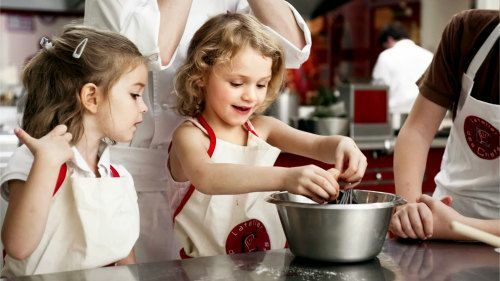 Get cooking: pick a recipe with the kids, go shopping for ingredients and cook something together that you can enjoy eating afterwards. Depending on your child’s age and interest, this could be anything from a simple sponge cake to a mushroom stroganoff! 9. Arrange a movie day: choose a couple of favourite films, get some popcorn and put your feet up with the kids. 10. Create a scrapbook: Create a scrapbook together using photos from your family album, or torn from magazines.